Limes steeped in vodka, grapefruit and lashings of salt go into this invigorating face and body scrub - now in a self-preserving formula. The salty, citrus fragrance is refreshing on the skin and mind, like diving into the cool blue ocean. 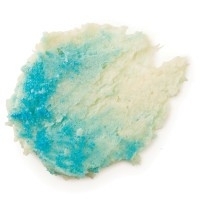 Sea salt is rich in minerals and excellent for scrubbing away any dead skin. We also added rich, silky avocado butter, coconut oil and seaweed absolute to keep your skin soft, smooth and conditioned. I love the Ocean scrub original as it is like a balst od sea air with a vodka cocktail in your face. It is salty scrubby but they have ground the salt a bit more now so it is not so scrubby and rough. It works on enzymes so I gently massage this into my face then leave it for a minute or so before rinsing it off. Be VERY careful not to get it in your eyes as it will sting like mad. The citrus helps to tone the skin, the sea salt scrubs and cleans the pores, the lime in vodka refreshes and rejuvenates and awakes the skin while the mango butter softens. The minerals in the sea salt also soften as it scrubs away dirt, dead skin and blockages in the pores which gives afresh bright look to your skin.The avocado and coconut also with the mango butter help to hydrate the skin, leaving it balanced and soft. This has tofu in it but I am not quite sure what that does apart from giving it a creamy texture but I believe it can help moisturise the skin. Anyway good on Lush for trying to get those synthetic and chemical preservatives out of some of their products. You can buy either this version or the original depending on your preference. "I love the Ocean scrub original as it is like a balst od sea air with a vodka cocktail in your face. It is..."